If you’re close to a place that’s called Miami, Ohio, it’s likely that you’re attending Miami University. When you’re in Ohio and you refer to Miami, it’s referring to a tribe of people that used to inhabit the land. So while there isn’t an actual city on the map called Miami, Ohio, there is Miami University, which is located right outside of Oxford, Ohio. Whether you’re here to learn or have fun, you don’t want a toothache to get in your way. When you check out emergencydentistsusa.com, you’ll see that we have created a list of dentists that are in the area to help you with your tooth pain. You can view the hours that they are available, the types of insurances that they accept, and the types of services that they offer all with the click of your mouse. If you’re unable to search on the web, or you’re having trouble, give our free dentist finder hotline a quick call. When you call our toll free dentist finder hotline, one of our friendly operators will be glad to help you find a dentist that can assist you right away. They’ll go over the available options with you, and when you choose the office you’d like to visit, they’ll even provide you with directions and set your first appointment. Once your first appointment is set, be sure to arrive ahead of schedule and bring your ID, insurance card, a list of any current medications, and a list of anything you may be allergic to with you. If you’re experiencing an emergency toothache, the last thing that you want to do is try to find a dentist that has the availability to help you. We make that simple by providing an easy-to-read list of available dentists in the area. Since Miami University and the surrounding area is quite large, you’ll have no shortage of dentists to choose from. Most patients will go to a general dentistry first to have their toothache assessed and then be referred to a specialist, if needed, from there. Description: This office makes building a relationship with their patients their first priority. This helps them to better understand your expectations when it comes to your dental care. They show their patients how to maintain beautiful smiles that will last a lifetime. Description: The office of Steven Lang offers patients general dentistry as well as cosmetic and restorative dentistry. They help their patients maintain a dazzling smile for life. Not only do they treat any issues, but they also teach comprehensive preventative care. Description: Miami County Dental Clinic focuses on teaching their patients preventative care when it comes to keeping a healthy smile. They practice general dentistry in a friendly environment and take time with each patient to ensure they are happy. They make sure that each patient’s beautiful smile will last them a lifetime. If you’re experiencing tooth pain, the best thing to do is find an emergency dentist quickly. Don’t let the pain last longer than one to two hours. If you’ve been involved in any sort of accident that involved your face or mouth area, have it checked out by Urgent Care first to be sure you don’t have any broken bones. Once they’ve cleared you there, you need to head straight to the dentist. 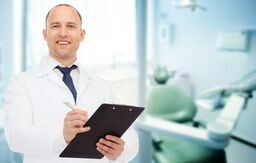 When you’re visiting a dentist for the first time, it’s important to be sure that they are current on their classes and credentials. You can easily check this before you go to your appointment. Simply type in your doctor’s name on the Ohio Dental Association website and you’ll be able to view all of their information. If you don’t remember to check before your visit, it’s likely that they will have all of their certifications and credentials hanging along the walls within their office.